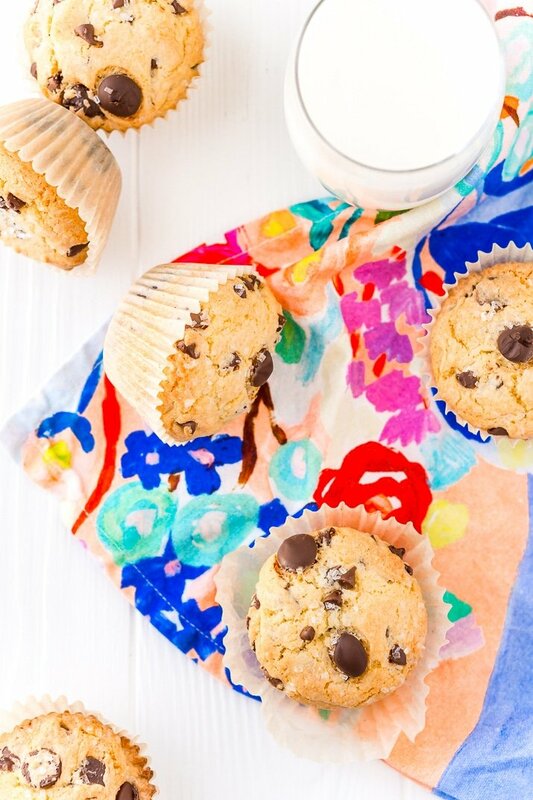 These Chocolate Chip Muffins are just the thing to start or end your day! 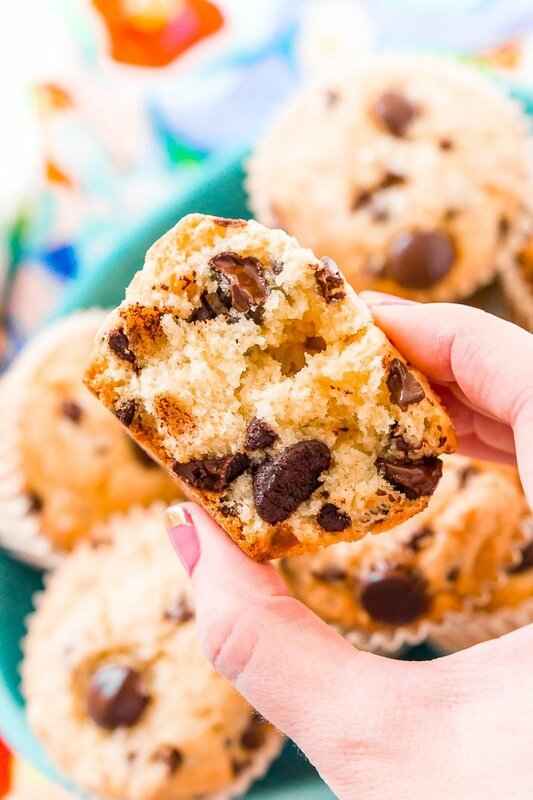 A little dense and a little sweet, these cookie-like muffins are like eating dessert for breakfast! Good morning all! Today I’m sharing one of my favorite breakfast treats – muffins. I usually have a nice sensible breakfast, like scrambled eggs and avocado toast with fruit, but sometimes I crave a sweet treat. 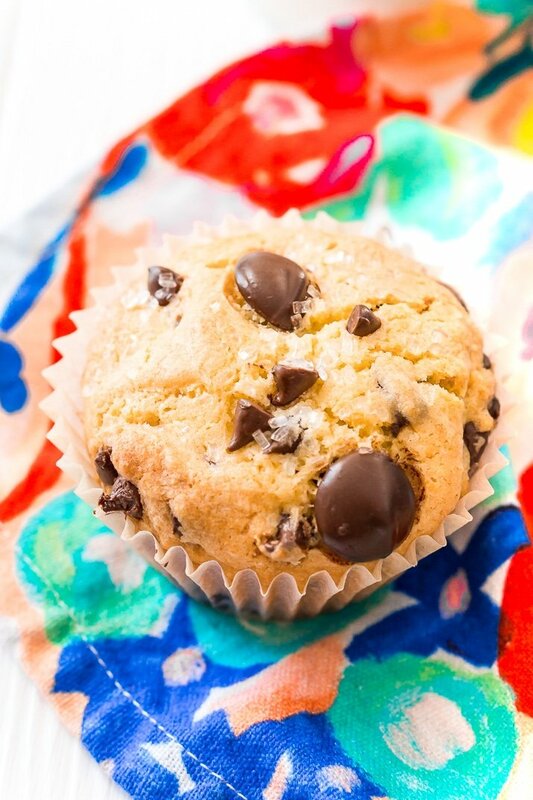 These Chocolate Chip Muffins are the perfect cure for that craving! Muffins are pretty popular around here, in fact, my Strawberry Coffee Cake Muffins are the most popular recipe on this site! 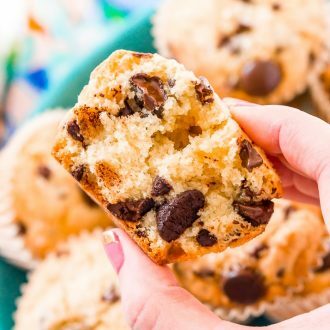 But when you really want chocolate for breakfast, I promise, these cookie-like Chocolate Chip Muffins are the only thing that will do! I say cookie-like because that’s exactly what they are. The outside is crisp, buttery, and sweet like a cookie and the inside is a dense but soft muffin. They’re so good! I may be a little biased as chocolate chip cookies are kind of a weakness for me, but they are amazing. And any excuse to have dessert for breakfast is good with me! These muffins are pretty versatile and you can adjust the fixings however you’d like! You could do all mini or all regular chocolate chips. You could add a teaspoon of coconut extract to the batter and fold do 1/2 cup shredded coconut and 1 cup chocolate chips – YUM! You’ll start by preheating the oven to 375 degrees F and line muffin pan with liners and set aside. Next, in a medium bowl, you’ll whisk together the flour, baking powder, and salt. It is important that you use a whisk and not a wooden spoon or spatula because this process lightens the flour and makes it easier to work into the batter. Set aside. Then, in a large bowl or stand mixer, you’ll beat together the melted butter and sugar until combined. Add in the eggs one at a time mixing after each addition. Mix in the vanilla extract until combined. Then, you’ll add the flour mixture to the egg mixture and mix just until combined. Fold in the chocolate chips with a rubber spatula. Finally, Use a 1/4 cup measuring cup to measure and add batter to each muffin liner and bake for 25-30 minutes. Allow the muffins to cool for a few minutes in the pan before transferring to a cooling rack. 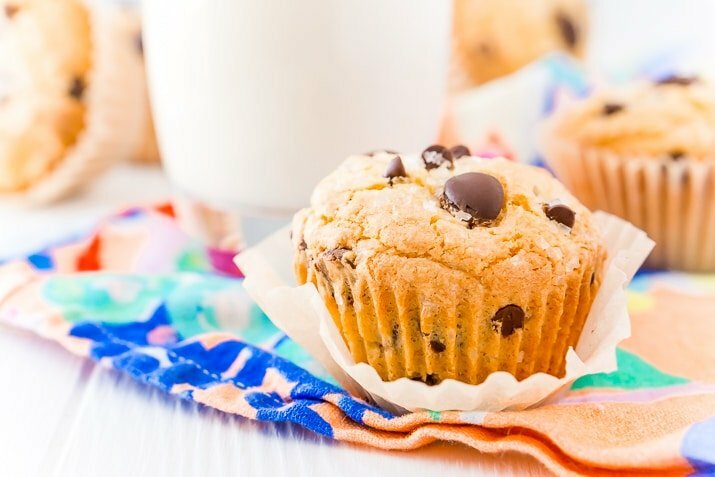 Pin this Muffin Recipe for Later! This recipe was originally published January 21, 2015, it was retested and updated in February 2018. Preheat the oven to 375 degrees F and line muffin pan with liners and set aside. In a medium bowl, whisk together the flour, baking powder, and salt. It is important that you use a whisk and not a wooden spoon or spatula because this process lightens the flour and makes it easier to work into the batter. Set aside. In a large bowl or stand mixer, beat together the melted butter and sugar until combined. Add in the eggs one at a time mixing after each addition. Mix in the vanilla extract until combined. Add the flour mixture to the egg mixture and mix just until combined. Fold in the chocolate chips with a rubber spatula. Use a 1/4 cup measuring cup to measure and add batter to each muffin liner and bake for 25-30 minutes. Allow the muffins to cool for a few minutes in the pan before transferring to a cooling rack. Swap out chocolate for butterscotch chips, caramel chips, white chocolate chips, or a variety of chips. You could add a teaspoon of coconut extract to the batter and fold do 1/2 cup shredded coconut and 1 cup chocolate chips - YUM! These look great and I would eat them for breakfast and dessert! Just saying! These look insanely good! I love everything chocolate and chocolate chip cookies are my favorite! I found you through the Mom 2 Mom link-up. Mmmm…Any time I can have an excuse to eat dessert for breakfast too, I’m there! 🙂 These muffins + hot cup of coffee = awesomely delicious start to the day! Pinned! These look soo delicious! We love muffins and I’m sure my husband the kids would LOVE these! Would be so happy if you shared any of your recipes at our link up prty on my blog tomorrow please 🙂 Have a great rest of the week! I like the fact that these have a vanilla base rather than a chocolate one. It’s not that I am against chocolate, but sometimes, it is nice to have something different. My kids would go crazy for these muffins! Thanks for linking up with What’s Cookin’ Wednesday! Yum! Those look so good! My kids would love them, and I would too! Thanks for sharing them with us at #FoodieFriDIY! Sharing! Oh these muffins make me SO hungry every time I see them 🙂 Thank you so much for attending week 19 of #PureBlogLove and linking your fantastic blog post, I can’t wait to see what you have in store for our next party, Thursday 8 PM EST- Sundays at midnight. Your post has been added to the #PureBlogLove Pinterest board for all to see 🙂 Have a great day! My wife just made this last night and it turned out great! She improvised a bit & made a 2nd batch with some peanut butter. They are perfect for breakfast, too. Yummy. That’s wonderful! I’ll definitely have to try it with peanut butter, I don’t think you can go wrong with that! Hi Denise, I’m sorry to hear that these muffins didn’t turn out for you. This was a post from another blogger that was contributed to my blog, I have never tried it myself but will put it at the top of my list for retesting. Can you tell me what it was that made them not turn out? Sunken centers? Flavor?